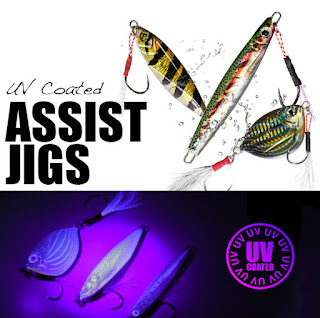 Lunkerhunt Assist Jigs are designed for offshore, near shore, and inshore fishing. They are effective when fished from boat, kayak, reefs, piers, and wharfs. Lunkerhunt Assist Jigs come in three body styles: The Flutter Jig, The Needle Jig and the Cut Bait Jig. All Lunkerhunt Assist Jigs have a UV coating and either a single dressed or double dressed assist hook. All Lunkerhunt Assist Jigs work well with speed retrieves, lift and fall retrieves and traditional jigging techniques. They have been designed for saltwater fishing but also catch a wide range of freshwater species as well. Labels: ICAST 2018: Lunkerhunt's New Assist Jigs, spoon, vertical jigging.